As a teacher myself and someone who lives in the South Florida area, this article about a recent issue at an elementary school over a teacher's right to wear a nose ring sort of jumped out at me. From "Nose jewelry ruffles schools:"
A recent dispute over a teacher's wardrobe had nothing to do with flip-flops or a low-cut top. Instead, it was a piece of diamond jewelry, about twice as wide as a dime's thickness, that raised the eyebrows of Martin County school officials. A nose stud isn't professional dress, district officials said. Last month, a federal arbitrator ruled in their favor. The case, the first of a teacher filing a grievance over the district's professional dress policy, started in September when officials at Hobe Sound Elementary told first-grade teacher Julie Roberts, 40, to remove her diamond nose stud, which measured about 2 millimeters in diameter. Teachers union representatives argued that the district didn't have the authority to arbitrarily dictate a working condition that wasn't agreed upon and never discussed at the bargaining table. Furthermore, the school board rules "encourage" a certain wardrobe, but they don't specifically forbid facial piercings, union representatives argued. The arbitrator disagreed, saying the school district did have the authority to require Roberts to remove her nose piercing. He said a committee of "moderate-minded" principals and teachers could define professional dress in the future. Florida Education Association's Falvo said the teachers union plans to address wardrobe during contract negotiations this summer. I find this interesting because I am so careful about what I wear when I enter a classroom. It would never occur to me to wear jewelry like this. Times are changing I guess. Of course, I'm also a big baby when it comes to getting holes punctured through my body. It's all I could do to get my ears double pierced. 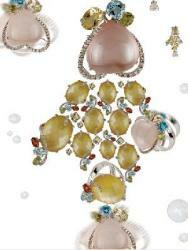 Wedding jewelry is often dictated by the style of the wedding dress as well as a woman's own unique flair for style. With the popularity of strapless gowns and halter-style dresses for both the bride and her bridesmaids, the trend towards showy diamond jewelry is increasing. These dress styles go great with diamond chandelier earrings and layered necklaces. Even the engagement rings have gotten showier, with cuts that promote a bigger face for the money being popular, and rock sizes going past the usual 1-carat diamond size. If the bride wants to add more glitz, she can opt for a layered set of diamond rings or bracelets too. Diamonds make great accents at weddings adding the needed sparkle to all the lace and finery. The elegant upswept hairstyles common today are begging for some diamond jewelry hair combs or tiaras. Diamonds are even sometimes sewn into the dresses to help add sparkle to the gown as well. Bridal jewelry is a very popular way to say "thank you" to the bridesmaids. It is multifunctional in that it can be worn to amp up the wedding festivities and shown off in bridal party photos. It can also be reused by the bridesmaids, giving them lovely memories of the wedding every time they choose to wear it. The groom isn't left out either! He can now choose to add his own diamond accessories for himself and his wedding party. Couples are now buying dual engagement rings, one for him and one for her. Other times, the matching wedding bands are set with diamonds and can be a stunning feature when carried on a tiny pillow by the ring bearer. 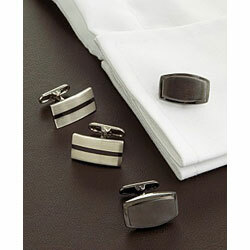 Diamond cufflinks make a good accent for a tuxedo and as a gift to the men's wedding party as well. If that is too traditional, watches are now available which can be bought with diamond accents in the face of the watch. They also make good wedding gifts. I saw the cutest little gold earrings the other day on QVC, and I came this close to buying them for myself. I may still get them, but I reminded myself that I had a few bills to get past before I would allow myself to spend money on something I could live without (at least for a few weeks) first. So, how many of us feel comfortable buying fine jewelry for ourselves? Other types of jewelry, such as beaded and/or bridge I can make, so I'm always "giving" myself some kind of new jewelry piece, but when it comes to jewelry I'd considered fine jewelry, that's another story. The JCOC set out to explore consumer willingness to buy fine jewelry for themselves. This report not only reveals what style of fine jewelry JCOC panel members are interested in, but their motivation, purchasing habits and much more! You can download a free copy of the whole report here. The report is 20 pages long, so I'm still making my way through it, but it's pretty interesting. It looks like a good number of jewelry lovers do shop for themselves, so I guess I need to get over it. What about you? Do you buy jewelry for yourself, or do you wait and give a lot of hints in hopes that someone will buy it for you? The idea behind Sara Blaine Jewelry has always been to create beautiful jewelry using the best quality stones. Sara has successfully found the happy medium between "the trend" and a timeless elegant piece. Her ability to mix unique colors on the stone color pallet sets her apart from other high-end jewelry designers. Brilliant color mixtures that one may not think to put together, Sara combines with ease. This design inspiration is complimented by a company that places great value on a genuine and gracious manner in all relationships. Sara Blaine Jewelry is elegance meets color meets quality. Jewelry-wearing is not just an accessory to Sara, but a statement. Sara is in tune with the importance of our personal sense of style and has created a jewelry line successfully reaching all types of women. 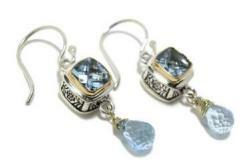 I am especially attracted to her use of mixing metals in the settings for her faceted gemstones, and of course, she also is a bead lover (as am I). Each Giovanni Birth Flower is imbued with meaning and tells a story and history linked to love and happiness. November, for example, is represented by the Chrysanthemum, representing "abundance of compassion and devotion." 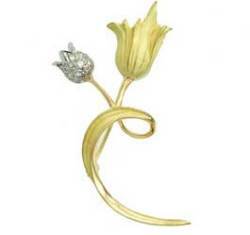 Birth Flowers can be worn as a pendant or brooch, and the collection also offers rings and earrings. "The origin of birth month flowers goes back to the Roman Empire, when it is believed that birthdays were first celebrated, We can't think of a better way to celebrate special occasions and birthdays than with a Birth Flower that will last forever — full of beauty, history and meaning." Since May is about to leave us in a few days, I picked this flower (pictured) for all those who had a birthday this past month. So, I thought it appropriate to give a little review here in case any of my readers have been thinking of taking the massive jewelry box plunge. One of the reasons I had to wait so long for this was because the oak cabinet was on backorder. I'm glad I waited. This puppy is pretty big, and a big white armoire would have been just too much. I like the look of the light oak. There are loads and loads of earring storage, though it is a little tricky with these old eyes of mine to fit the earring hooks through the tiny holes in the earring organizer section, which by the way, pulls out, very handy. I wasn't sure about the large drawers at first; there are two at the very bottom with no dividers. However, I soon realized that they are great for things like my watch collection, which has its own (fairly large) box. So, these are perfect for jewelry pieces you like to keep in jewelry boxes. I'm slowing transferring my jewelry to its new home. One thing I started to realize that, ugh!, I really need to clean this stuff, especially my silver jewelry. This particular armoire is designed to keep tarnish away, but if it's already tarnished that's not all that helpful. It does require a small amount of assembly, but it comes with its own small screw driver and my DH was able to put it together in about 15 minutes since the main part was already put together. He just had to attach the legs and the top. Generally, speaking, we both felt it was pretty well made. The Gold and Silver Safekeeper Armoire by Lori Greiner helps preserve your jewelry with a special lining while it carefully stores your treasures with cubbies, hooks, drawers, and compartments for everything. Fully lined with Silver Safekeeper anti-tarnish cloth, it helps keep your silver jewelry from tarnishing for up to 25 to 40 years when used properly. Spacious and gracious, this armoire is a fine piece of furniture, crafted with skill and care from fine wood and wood veneers. 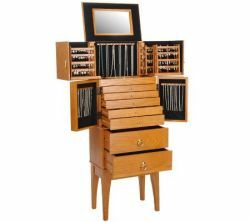 Specially designed compartments and ten earring stands allow easy access to at least 500 of your favorite pieces. A wood-framed mirror on the tilt-back lid lets you check your appearance while you accessorize. Measures approximately 44-1/2"H x 16"W x 10-1/2"D.
Cherry Finish or Oak Finish. - "Palladium Today: Its Place in the Market," a panel discussion by Daniel Ballard of PM West, Teresa Frye of TechForm Advanced Casting Technology, and Lisa Krikawa of Krikawa Designs. - "950 Palladium: The Fundamentals for Success in Design and Casting" by Teresa Frye of TechForm Advanced Casting Technology. 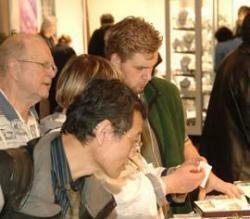 - "How to Set up a Casting Operation in a Small Shop" by Chris Ploof of Chris Ploof Designs. - "Tips and Tales from the Platinum Bench" by Jurgen J. Maerz of Platinum Guild International. - Book Signing by Jurgen J. Maerz. Maerz will sign copies of his latest MJSA Press book, Adventures at the Bench: Tricks to Overcome a Jeweler's Daily Challenges, sponsored by Johnson Matthey New York. "Optimizing Your Gravers and Other Tools for Pave and Bead Setting Gemstones" by Arthur Anton Skuratowicz of the Jewelry Training Center. - "Quick Start Wax Carving with Kate Wolf" by Kate Wolf of Kate Wolf Designs. - "Promotion, Pricing, and Production – a Primer" by Chris Ploof of Chris Ploof Designs. - "Safe Jeweler, Safe Shop" by Arthur Anton Skuratowicz of the Jewelry Training Center. This presentation is part of the MJSA Safe & Secure Outreach Program and is sponsored by G-TEC Natural Gas Systems. The bench and tools are sponsored by Stuller Inc.
For more information, please contact Teresa Shannon, MJSA Jewelry Academy director, at 1-800-444-6572, ext. 3103, e-mail teresa.shannon@mjsa.org, or stop by MJSA Booth #L9 in the Sands Convention Center at JCK Las Vegas. The jewelry and fashion bloggers are cover all kinds of trends this week, starting with dear old dad. Find out what's tops for Pops with StyleBakery.com's list of Father's Day Gifts he's sure to love. LA STORY suggests you "Surrender" to the luscious voice of Jane Monheit in her podcast! It's sale season at Bag Snob so get your goodies before they sell out! Don't you hate it when you spot another gal in your favorite outfit? Coquette introduces you to the unique handprinted fashions of Snoozer Loser. Zzzzzz…..time to catch up on your beauty sleep, advises Fashiontribes. In honor of Better Sleep Month, learn the secrets of a good night's sleep from experts at the Better Sleep Council. Girlawhirl says FitFlops are all the rage in London. Some dames dig dogs, other kittens cuddle cats-Kristopher prefers glammy dead animals, like a [vintage alligator bag]. Second City Style is making beautiful music with the accordion…pleat this summer. SheFinds – -Fashion, Beauty, FINDS – Chic Luggage for Chic Travelers. Styleaholics – Love the 80's? Love Cassettes? Then you're gonna love these wallets! Stylehive has just launched Style Communities with great brands such as [InStyle, Gap, Shopbop and Ron Herman]! Check them out and join today! Jewelry and Beading finds out how to make Kiffa beads from African artisians. Debra Messing is looking fabulous here at the LA premier of her new television show, The Starter Wife. Along with the perfect dress, she is wearing platinum jewelry by Neil Lane, including several platinum and diamond ball bracelets and earrings plus a cocktail ring. I'm not usually big on television shows in general. In fact, I usually like the what no one else seems to like, but this new show of her look interesting. It's about a divorced woman who has to sort of figure out her life again and is based on the novel by the same title. The first show is out on May 31st on the USA networks, so we'll have to wait a few more days. You can see more about the show as well as a video preview on The Starter Wife web site.